Have you ever wondered what my number 1 fridge staple is? Well wonder no longer! This busy (read: sometimes completely frazzled!) mamma’s absolutely essential ingredient is Bone Broth Rice. It sounds so simple. It is so simple! But boy, oh boy can you reap the benefits for days afterwards. I always cook a batch of grains (whether it be wholegrain rice, spelt, freekah or quinoa) in some bone broth on a Sunday night. It requires minimal ‘tending to’ on the hob and is ready for me to use throughout the week. As long as I know I have some of those pre-cooked grains, I know I’m not going to go hungry. Not only does cooking the rice in bone broth make it so much more flavourful, but it is also very restorative and gut-healing. It is an easy yet fabulous way to add a ton of extra nutrients without even realising. If I have the time, energy and inclination, then I make my own bone broth (more on that in another post! ), but most of the time, I use Ossa Organics pouches instead. What to do with the rice? I either add it into some soup for some much needed extra energy because without any complex carbs, the soup alone definitely isn’t going to fill me up at lunchtime to keep me going until dinner. Or else I throw the cold rice into a salad. I used to tend to shy away from salads at lunchtime because I would be starving again an hour later. But when it is whole grain based with a ton of veggies and some protein, then I know it will sustain me for the rest of the day, as well as only taking less than 10 minutes to throw together. But my very favourite use of the rice, is making a fancy nutrient dense version of egg-fried rice. This one is packed with a rainbow of brightly coloured vegetables, but is on the table in 15 minutes flat. It is as easy as chopping whatever veggies look like they are about to go off in your fridge, sautéing them, adding the rice, the egg and some seasoning. Et Voila! Making an easy, quick yet nutritious dinner that the whole family can enjoy is an absolute godsend to have up your sleeve. Another reason why I love this dish is because it can either be majorly simplified or jazzed up, according to a) what you have the energy for and b) what you have in your fridge. I just adore a meal that I can still prepare when I have zero fresh produce in the house – it makes me feel like I could survive some sort of zombie apocalypse! For the basic version, all you need is some frozen peas, tinned sweetcorn and an onion. I feel like I always have those in my kitchen no matter what. And for the fancier version, I add a ton of other fresh veggies (really any work, so no need to actually stick to the suggestions below), as well as some grated ginger and turmeric for an extra immune boost. One portion provides 361 calories, 15g protein and 4g of fibre. But it also provides 57% and 22% of my daily Vitamin A and C requirements respectively, which is great news for my immune system too. NOTE: If you are only using half of the rice to make this, so that you keep the rest on hand for soups/salads, then just halve the amount veggies and eggs. · Rinse the rice well to get rid of any excess starch. · Put it in a saucepan with a bit of ghee or oil and stir to coat the grains. · Add the 500ml packet of the bone broth and bring it to the boil. · Stir (only once), put the lid on and simmer on a low heat. · Cook for another 30-35 minutes as per the instructions on the packet. · Turn off the heat and fluff with a fork for a better texture. · Peel and chop the onion. · Drain the tin of corn. · Finely chop the carrots, red pepper and courgettes. · Heat a tsp of ghee or oil in a large wide-based frying pan over a medium heat. · Add the onion and sauté for a few minutes before adding the carrots, courgettes and red pepper. · Continue to sauté for a few minutes before adding the garlic, chillies, grated turmeric and ginger, if using. · Add the rice, peas and sweetcorn and pour in the liquid seasonings (toasted sesame oil, soy sauce, mirin, Japanese rice vinegar and a squeeze of lemon). · Combine well and then make a hole in the middle. 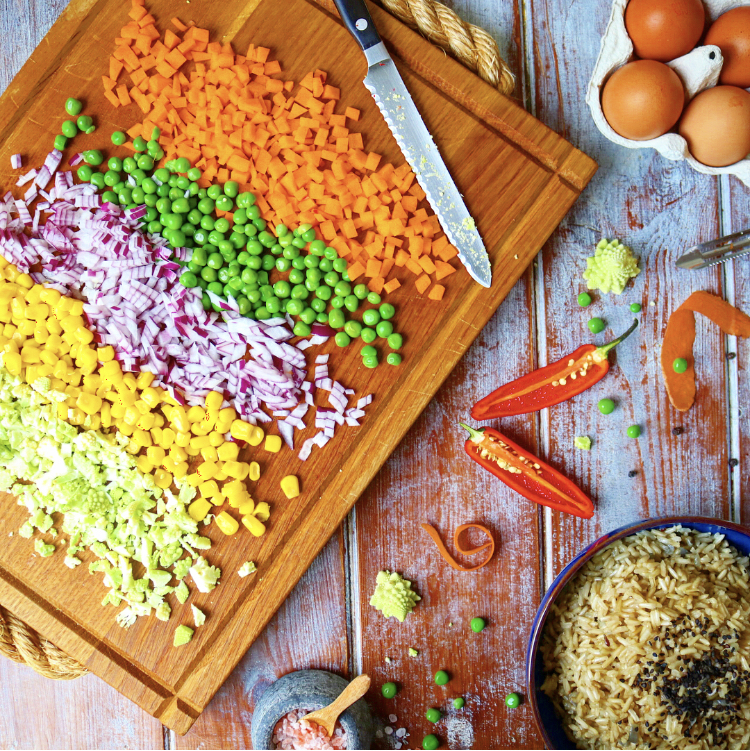 · Crack the eggs in and immediately mix and incorporate with the rest of the rice and vegetables. · Continue to cook for another 5 minutes. · Sprinkle with black sesame seeds and serve immediately.